Growing up, I attended Japanese weekend school and I've been in and out of my Japanese grandmother's house my entire life. This--plus knowing that on the other side of my family, my grandfather was fighting against the Japanese--has always given me mixed feelings about how we're taught about the end of World War Two in school. Like, on the one hand, I'm here because the Americans decided not to bomb Sasebo, which was one of the cities under consideration. But then, the bomb killed thousands and affected so many peoples' lives with so much cruelty that I grew up taking the Japanese side in the argument. How can you inflict something like that, even on your enemy? How can you inflict a bomb that vaporizes people, so that they're only left as shadows? But then again, I'm here because my Irish-American grandfather didn't have to go and invade the Japanese home islands. Growing up, also, every story I read in Japanese school had to do with the war. 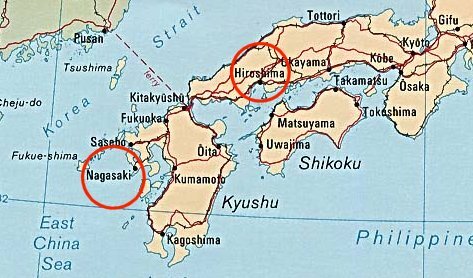 Family lore has given me the story that my grandmother, who was in her late teens in 1945, could see Nagasaki's mushroom cloud from Sasebo--I have no idea if the cloud was high enough to actually see it in Sasebo or how the bomb might have affected the cities surrounding Nagasaki. I began reading a book about the bombing of Nagasaki today, hoping to gain insight into what happened there. Because it's been seventy years since the bomb and the generation that lived through it is getting old, growing forgetful, and dying and soon, we won't have a chance to ask them questions about what happened. I couldn't even tell anyone when the bomb was dropped. I know they probably told me in history class, but I tended to block out disturbing things, that's assuming I heard them in the first place and hadn't zoned out from boredom. My grandfather talked about his time in Germany some before he died. I'm so glad I got to hear his side because he died a few years later, and it's just not the same coming from someone else. Of course, he had an entirely different perspective. And when I think WWII, I think Germany. I couldn't even tell anyone what the Japanese involvement was outside of Pearl Harbor, and I know very little about that, too. I didn't even like the movie. You definitely get a different perspective when you're given the opportunity to learn history from another point another view like you were. Yeah, I think so. And to be honest, I'd rather *read* about Americans fighting Germans in Europe. I've read a few novels based on Japanese internment now and they always make me cry. I went through a thing with the movie. Specifically, Josh Hartnett. It's a terrible movie, though. My mother was a toddler when the bomb was dropped on Hiroshima and her family lived about 30 miles away in Iwakuni, Japan. Little did she and her family know that 64 years later she would die of a rare form of cancer caused by atomic radiation exposure in developing young toddlers. It's on her death certificate. Cause of death - atomic radiation; gestation - 63 years. Oh, my God. From 30 miles away. 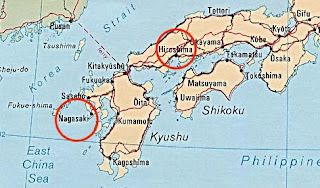 I haven't heard of anything going down in Sasebo after the bomb in Nagasaki, but it's about the same distance, I think.